In the last few weeks, I have had several interesting conversations with women about prayer and praying for their husbands -- they pray for their children regularly, sometimes out of sheer desperation, but did not always recognize the need to pray for their husbands. It is not uncommon to find that spouses do not spend much time praying for one another. When you are married to a faithful, Godly man on whom you can rely for spiritual guidance and support, it is easy to take that faithfulness and Godliness for granted. When I was newly married, I had much the same thought (or lack of thought) about praying for my husband. It was just not on my radar. Then I met a wonderful woman who was a few years older than me and had been married a little longer. She shared some of her experiences with prayer and it changed my perspective forever. Her husband was a full-time seminary student. She was working full time to support them and was struggling with a disconnect between them in their busy lives. During this struggle, she started praying for her husband, not because there was anything wrong, but because she realized this was her ministry to her husband and a way for her to take a vested interest in his daily life. 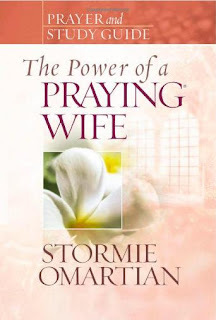 She also shared with me a book that she said changed her life: The Power of a Praying Wife by Stormie Omartain. I received this book as a gift and had just started reading it. It was so encouraging to have someone to talk with as I learned about my husband and the importance of prayer in our marriage. I have not always prayed as faithfully for my husband as I should have, but I am continually grateful for the lessons God taught me early in our marriage about my ministry to my husband through prayer. Because of my recent conversations, I decided to start blogging through this book and share some of the encouragement I have received. I may not write about every chapter, but I hope to encourage my readers to remember the power and importance of prayer as a ministry in marriage. Stay tunes for future posts in this series. Thanks for the reminder that I should be praying for my husband more! And I look forward to your series about this book--I've been curious about these "power of the praying..." books but never read one. I wonder if my library carries them?